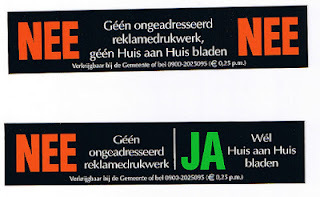 In The Netherlands, you can opt out of receiving the weekly kilos of advertisements by placing a simple sticker on your front door. The "NEE - NEE" version means you are saying no to all unaddressed advertising as well as addressed advertising. (Some companies hope to sneakily circumvent this and reach people by addressing their paper spam to "The Resident Of This House." 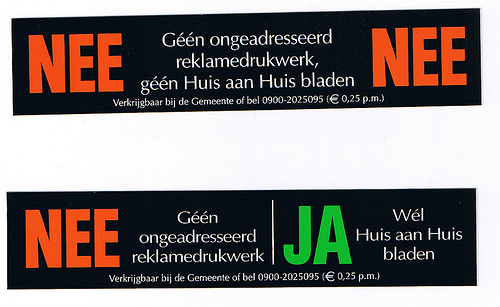 The other variant of the sticker is "NEE - JA" which means you don't want all the circulars, flyers, and ads but do want the advertising directly addressed to you. After twenty years of residing in Holland I still don't understand the difference! As a tree-loving Oregonian, what surprises me about all of this is that there is still so much tolerance for printed paper advertisements in a country which claims to be so environmentally-friendly. (There must be at least a small Christmas tree from the Black Forest lying on my doormat this evening). 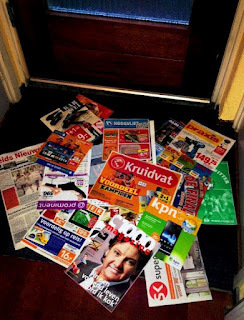 I am convinced that this is all part of a massive conspiracy to keep the printing presses alive after the death of so many newspapers here recently in The Netherlands. I like those. All we have is a black and white 'KEINE WERBUNG!' - it's so demanding that I feel bad putting it on the mailbox. Tonja - don't feel guilty -- most junk mail is unsollicited, i.e. you didn't ask for it!